Most of us rely very heavily on our vehicles in our day to day lives. When you do have an unexpected mechanical problem, it does more than inconvenience you - it can bring your schedule to a complete stop! When this happens, you NEED a professional to get you rolling again, but what you WANT is to be dealt with honestly. You want to know what is wrong with the vehicle, what needs to be done and what it will cost. At Glenwood Auto Service, we are committed to providing you exactly that. Be assured, your vehicle will be professionally diagnosed and top quality parts will be installed by technicians with years of experience that you can trust. Follow the link to our promise! Potholes are an inevitable part of living in a multi-season environment which most of Canada experiences. For example, Toronto repairs on average 200,000 potholes a year. Cities with warmer annual temperatures like Vancouver repair on average 32,000 potholes a year. Spring is usually when we see our first crop of these lovely hazards but sometimes they show up sooner especially during milder winters. While their presence can’t be avoided there are a few things you can do to help your car make it through this unofficial season unharmed. 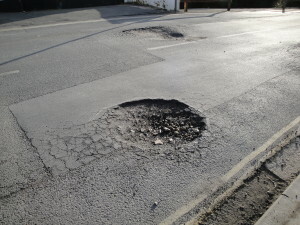 Be attentive – potholes can appear very quickly especially after a rainfall and a short freeze/thaw cycle. Drive the speed limit and don’t follow other vehicles too closely. Check your tire pressure. Keeping your tires (all four) at the recommended PSI will help cushion some of the impact. Proper PSI will also help with traction in case of a sudden stop, like the vehicle in front of you swerving to avoid a pothole. Try to avoid erratic swerving as your sudden movement could cause you to hit another vehicle. Just as you wouldn’t want someone to swerve dangerously in front of you, keep your vehicle under control at all times. If hitting a pothole is inevitable, don’t slam on the brakes. You will force the weight of your car FORWARD, and DOWN into the pothole, causing even more damage. How do you know you’ve damaged your vehicle? Your steering will pull to either the right or the left – this is your alignment and is needed for vehicle handling and proper tire use. If you feel as though your vehicle is swaying left to right, especially when turning corners, or is bouncing/bottoming out, your suspension may have been compromised. This type of damage could affect anything from your shocks, struts and ball joints to your steering rack, bearings, seals and tie rods. Visually inspect your tires looking for cuts or bulge along the rubber. Look for bends or cracks in the rims. This type of damage may seem superficial but could, at higher speeds, cause a blowout. If you do hit a pothole, take a minute or two, as soon as it is safe to do so, to visually inspect your vehicle and make special note of any damage to the tires. If you see any damage or feel like your vehicle just isn’t driving the way it normally does, visit your local automotive service provider for a quick inspection. Fantastic service IS the discount at Glenwood!